Along with updating the existing MacBook Air and MacBook Pro models, Apple has reinvented the MacBook Pro with a Retina display, as announced at Apple’s Worldwide Developer Conference keynote on Monday. The standout feature of the Retina-display model is the brand-new, high-density display. The new MacBook Pro's 15.4-inch (diagonal) screen has four times the number of pixels as the previous model at 2880 (horizontal) by 1800 (vertical), for a total of 5,184,000 pixels or 220 pixels per inch. Despite its glossy screen, it has a 178-degree wide viewing angle, has 75 percent less reflection, and 29 percent higher contrast than the previous generation, Apple says. The company says it was able to achieve this reduction in glare by building the layers of the display into the laptop’s Unibody frame, eliminating the need for a separate cover of glass. The laptop has a 2.3GHz quad-core i7 processor with 8GB of 1600MHz RAM (upgradeable to up to 16GB), a GeForce GT 650M graphics processor with 1GB of VRAM, and 256GB of flash storage. The new 15-inch MacBook Pro with Retina display weighs 4.46 pounds, heavier than a MacBook Air, but similar in weight to the 13-inch MacBook Pro. Like the new Air, it has no optical drive. Closed, it’s 0.71 inch thick—about as thick as the base of the old MacBook Pro but about as thin as an Air. Unlike the current wedge-shape of the MacBook Air, this laptop has a uniform thickness. 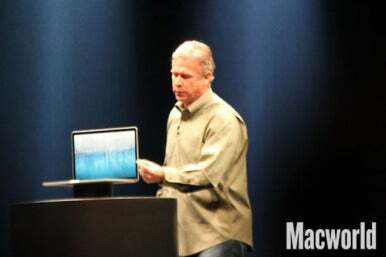 The new MacBook Pro with Retina display offers up to seven hours of battery life and 30 days of standby. Apple noted that the battery cells take up much of the interior. Built around flash storage, users can opt (when ordering) to equip the new MacBook Pro with up to 768GB of internal flash storage. It also features the fastest graphics on a Mac laptop—Nvidia GeForce GT 650M. The laptop also has 802.11n Wi-Fi, Bluetooth 4.0. a FaceTime HD camera, and dual microphones using beam-forming technology. There’s also the obligatory glass Multi-Touch trackpad and backlit keyboard. It also features an SD-card slot, HDMI out, two USB3/USB2 ports (one on each side), two Thunderbolt ports, and a headphone port. Apple also announced Thunderbolt-to-FireWire 800 and Thunderbolt-to-Gigabit ethernet adapters. The new MacBook Pro also ships with a new, thinner MagSafe 2 power port. Apple spaced the fan blades asymmetrically so that the fan noise is not a uniform sound, but more dispersed. The laptops is also environmentally friendly, with Energy Star 5.2 certification, and is arsenic-free, BFR-free, and PVC-free. It is also highly recyclable, and has mercury-free glass. Prices for the new MacBook Pro with Retina display start at $2199. It’s available immediately. 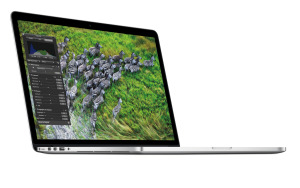 In addition to introducing the MacBook Pro with Retina display, Apple has updated the standard MacBook Pro line. 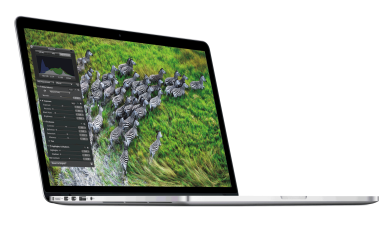 The 13-inch MacBook Pro is now available with a 2.5GHz dual-core Intel Core i5 processor, 4GB of memory and 500GB hard drive starting at $1199; and with a 2.9GHz dual-core Intel Core i7 processor, 8GB of memory, and a 750GB hard drive starting at $1499. The 15-inch MacBook Pro is available with a 2.3GHz quad-core Intel Core i7 processor, 4GB of memory, Intel HD Graphics 4000, Nvidia GeForce GT 650M graphics, and a 500GB hard drive starting at $1799; and with a 2.6GHz quad-core Intel Core i7 processor, 8GB of memory, Intel HD Graphics 4000, Nvidia GeForce GT 650M graphics, and a 750GB hard drive starting at $2199. Build-to-order options include faster quad-core processors up to 2.7GHz, additional hard drive capacity up to 1TB, and solid state storage up to 512GB. Both 13-inch and 15-inch (non-Retina) MacBook Pro models can be upgraded to 16GB of memory, but, oddly, Apple doesn’t offer build-to-order upgrades for the non-Retina models. There were no announcements regarding the 17-inch MacBook Pro. Apple’s MacBook Pro release came as the company also updated its MacBook Air lineup with new processors and USB 3.0 integration. We’ll have more details about the MacBook Pro later on Monday. Article updated at 12:00pm on Monday to include information on all models and configurations of the updated MacBook Pro line. Article updated at 2:10pm with additional information about the Retina screen and memory upgrades for the non-Retina models.